Facebook had hit headlines after hitting 1 billion registered users on sept 14 2012. But this number also includes a whole lot of bogus, spam an inactive accounts as well. With competition coming in the form of Google+, Facebook seems to have come out with a new scheme to attract new sign ups and you can earn some money too. Ask your friend who is not yet signed up in Facebook to go to this URL http://m.facebook.com/tt and sign up. He needs to input his number as well as your number as the person who invited him. The URL can be accessed from a PC browser as well and using a phone is not necessary. A few questions will follow including name, birth date and gender and password. 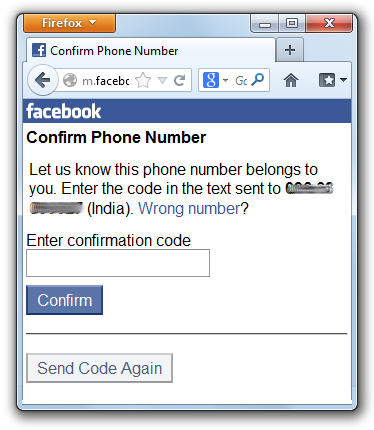 On submitting the details, a final mobile number verification is done by sending a confirmation code via SMS as well. Once confirmed, a new account will be created and Facebook will proceed asking to add friends, profile picture etc. That's it. Facebook will credit both the phone numbers with the amount advertised with in 3 days. 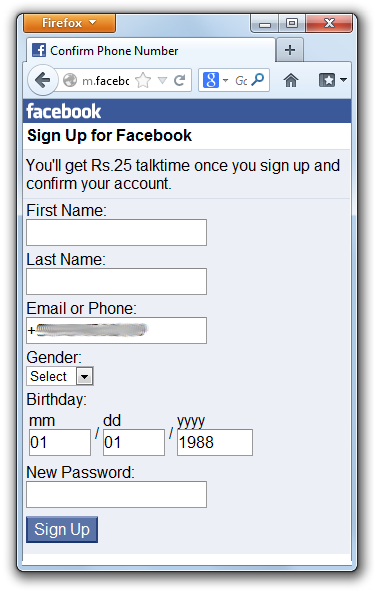 It is not clear how Facebook verifies the credibility of such sign ups and currently there seems to be none. That means if you just use the mobile numbers of your parents and grandparents who are not yet in Facebook to sign up, you can earn enough talk-time to last for a month or two . The offer doesn't seem to be available in every country as well. It is definitely available in India and the current offer is ₹25 per sign up at the time of writing this post. That's like 30-40 minutes of talk-time depending on the carrier which is really decent. 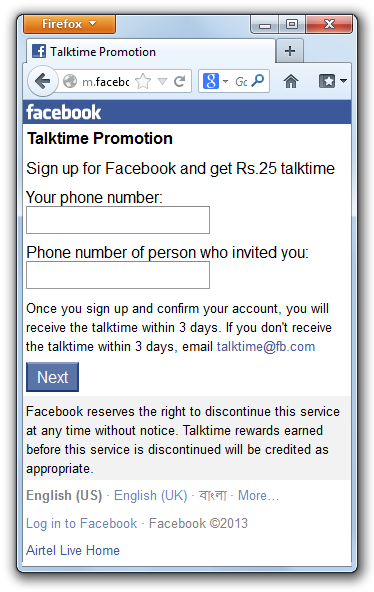 To check if the offer is available in your country, just visit "m.facebook.com/tt". If available, you will see the talk-time promotion page. If you find it available in your country, please do drop a commend and I will update this post with details. Hi Ravi, the links are not of any other third party website, but directly of Facebook itself. Definitely Facebook would not keep a spam page on their website right? Google Makes Sharing Android Apps on Google+ Easier.